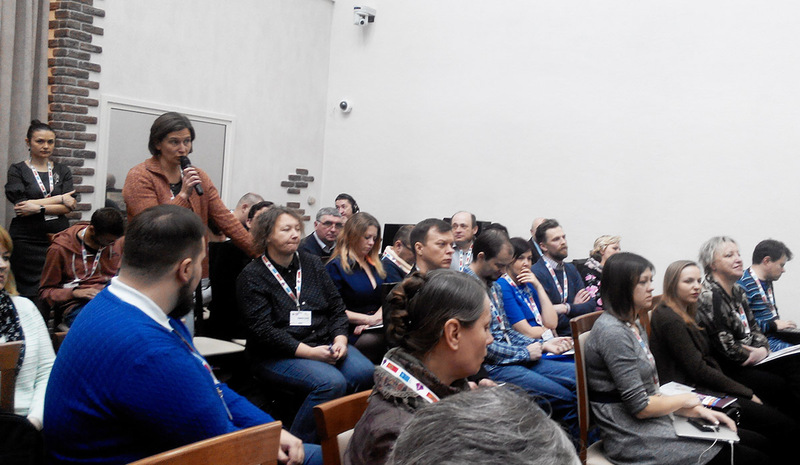 On March 15, the 23rd anniversary of the adoption of the first sovereign Belarusian constitution, a sociological study «Civic consciousness in Belarus, Ukraine and Moldova: survey results» was presented in Minsk. In Belarus, the representative survey of public opinion was organized by SATIO sociological company and commissioned by Pact Inc. international non-profit organization; in Moldova it was organized by CBS-AXA and commissioned by UNDP; and in Ukraine it was organized by Kyiv International Sociology Institute for the United Nations Development Programme, with support from the Ministry of Foreign Affairs of Denmark. In the photo, from left to right: Vasiliy Kukharchik (Pact Inc.), Darya Pirogova (Kyiv International Sociology Institute), Iryna Karobchanka (Promo-LEX Association Moldova), Vlad Velichko (International consortium "EuroBelarus"), Yuliya Tischenko (Ukrainian Center for Independent Political Research). 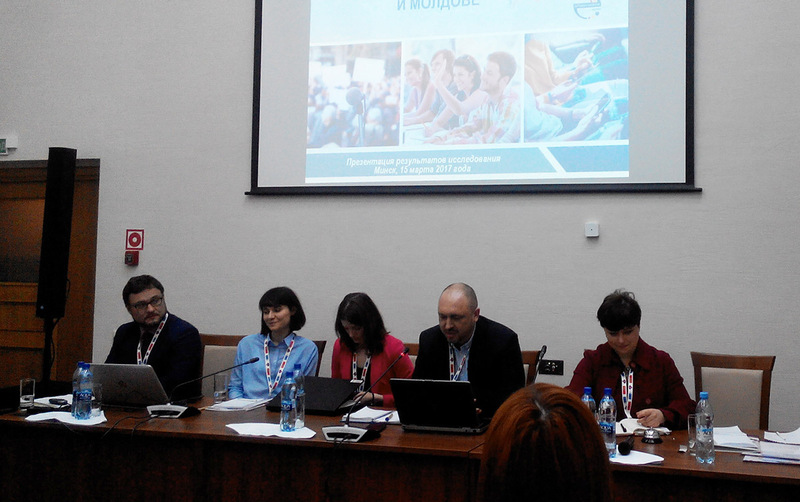 Results of sociological surveys organized in Belarus, Ukraine and Moldova from June to September 2016 were presented at the event. Find full text of the survey here. The analysis dealt with civic activism, beliefs and values, as well as with how people understand principles of interaction between the individual and the state, the degree of involvement in the decision-making process, as well as at both local and national levels. More than a thousand people were surveyed in Belarus, as well as 12 focus group: two in Minsk and two in each of the regional centers (Brest, Vitebsk, Gomel, Hrodna and Mahileu). Vasily Kukharchik (Pact Inc.) and Vlad Velichko (International consortium "EuroBelarus") presented and commented on results for Belarus. The international context was presented by Darya Pirogova (Kyiv International Sociology Institute), Yuliya Tischenko (Ukrainian Center for Independent Political Research), as well as Iryna Karobchanka (Promo-LEX Association Moldova). Results of the study are comprehensive and multifaceted. You can find some of its highlights below. For example, the survey looked into people’s views on their rights and responsibilities. When discussing their rights, most Belarusians named the right to life (50%), to work (49%), to education (30%), to healthcare (20%) and to freedom (17%), while respondents from Ukraine and Moldova mentioned the right to work and the freedom of speech more often. Vlad Velichko: "When people don't know their rights, they may be disappointed in the opportunities to realize them. At the moment, the institute of civic consciousness in Belarus has not been created yet, people live in the patriarchy remaining from the Soviet era, and an individual is considered to be a subject of the state rather than a person who is free to actively transform their life". Main duties which must be performed by every individual, according to Belarusian respondents, include the obligation to comply with the laws – 59% of respondents, and pay taxes — 40%. They also mentioned the duty to work (29%), protect the environment (16%), defend their country (16%) quite often. An interesting aspect of the survey was that it looked into civic activity and engagement. It found that Belarusians demonstrated the lowest level of willingness to join peaceful protest against the construction of a hazardous enterprise: 39% of citizens would not take part in such a protest. In Ukraine, this figure was 23%, in Moldova it was 19%. The highest percentage of personal willingness to organize such action was in Moldova (38%), while it was only 11% in Ukraine and 4% in Belarus. It can be noted that Belarusians are less inclined to participating in public protest actions, but a similar tread can be observed with the willingness to participate in common neighbourhood improvement activities: 27% of Belarusians would not take part in those (with just 16% in Ukraine and 15% in Moldova). At the same time, 40% of Moldova residents are willing to organize such activities themselves (14% in Ukraine and only 6% in Belarus). 28% of Moldovans, 18% of Ukrainians and 13% Belarusians would be willing to help organize such activities by donating money or clothes, wile 67% Moldovans, 59% Ukrainians and 47% Belarusians would be willing to take part personally. "Today, all of our countries demonstrate social ambivalence”, says Yuliya Tischenko, “On the one hand, we stand for the market and market relations, while, on the other hand, we stand for state paternalism and regulation of prices. People are willing to take part in civic activities, but want someone else to organize everything for them…"
Analysis has shown that Belarus has he smallest number of people who are proud of their national identity – 51%, while Moldova and Ukraine has 75% and 56% respectively. Experts and participants noted that the methods of survey can and should improve, and that such surveys are incredibly important to build civil society development programmes. The strength of the survey was in its attempt to compare processes and context of the three countries, but it is necessary to take into account that in the past few decades, each of the three countries has taken its own course, so one has to be careful when comparing respondents' answers. The discussion also touched upon the fact that the countries in the survey have no clear definition of civic consciousness and civic activism. Because of that, there is a risk that experts and civil society representatives understand these concepts differently from the majority of citizens. Thus, both formal and non-formal education pursuits the important goal of fostering civic consciousness in people, increasing the number of active people who are true citizens of their country.